I’ve had a busy two months, moving to a new home and getting buried in an urgent freelance gig, so not much painting has been done. 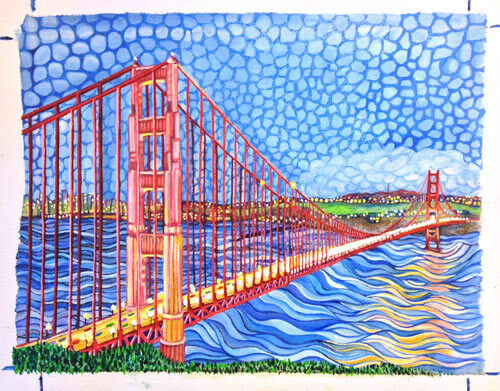 But now I’m back on the art trail, finishing up two pieces that were underway when I moved, including this Golden Gate bridge piece. It’s 8x10” and was a pretty solid underpainting until a few days ago. Now I’ve been working into the details and I think it’s becoming a pretty solid painting. I've worked on the water reflection, bridge lines and cityscape background. Next up is tightening the water and working on the sky. Here's how it looked in January.